Black Panther doesn’t come out until Friday but Letitia Wright, who plays T’Challa’s tech-brilliant sister Shuri, is already being dubbed as one of the breakout stars of the film. In the film, Shuri is more than just the 16 year-old princess of Wakanda, she’s a technological genius who makes Tony Stark look like a second-rate scientist’s assistant. Just so you know, Black Panther is already being dubbed one of the best movies in the MCU and is expected to rake in at least $170 million dollars during its opening weekend, so it’s no surprise that it boasts one of the most talented casts in Hollywood. But while the film stars a ton of A-listers like Chadwick Boseman, Lupita Nyong’o, Michael B. Jordan, Daniel Kaluuya, Danai Gurira, Angela Bassett, and Forest Whitaker, the actress people can’t stop talking about is Letitia Wright. Black Panther is just the beginning in what is going to be a massive year for the 24-year-old actress. Wright is set to reprise her role as Shuri in Avengers: Infinity War, which hits theaters in May, and also stars as Reb in Ready Player One, which premieres in March. But while we’ll be seeing a lot of Wright in 2018, most people will already be familiar with Wright’s work. 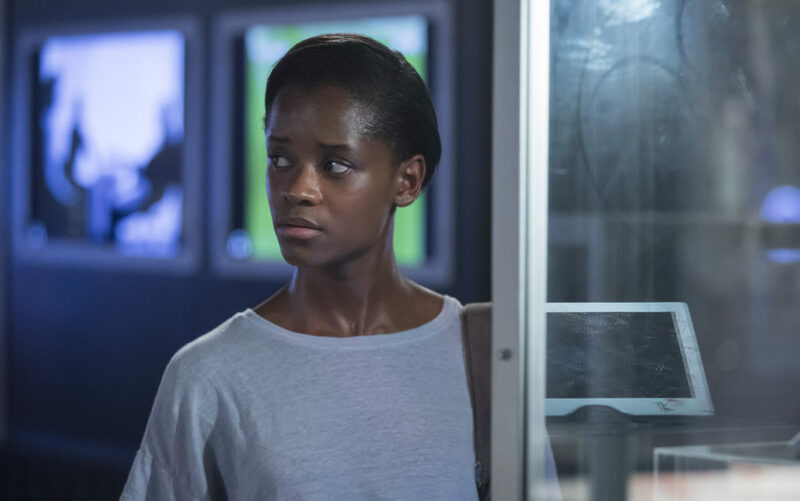 Black Mirror fans will recognize Wright as Nish from “Black Museum,” one of the breakout episodes from the most recent seasons of the Netflix anthology series. While on her way to visit her father, Nish stumbles into the Black Museum and its owner, Rolo, who shows her the collection. But like all Black Mirror episodes, it comes with a major twist. Also streaming on Netflix is the actress’ breakout starring role in 2015 film Urban Hymn, which follows Jamie, a young singer during the 2011 England Riots. Wright also played Vivienne Scott in British series Banana and Cucumber, which ran concurrently in 2015. The British sister series follow the lives of various LGBTQ people living in Manchester, UK, and were met with widespread acclaim when they debuted on Channel 4. In yet another film in which Liam Neeson runs into various troubles while traveling, Wright has a small role as Julia Skateboarder in The Commuter. The film follows Neeson’s character Michael as he’s forced into looking for a mystery person on a commuter train, uncovering a massive conspiracy in the process. Wright also recently had a recurring role as Renie, the girlfriend of Toby during the second season of AMC series Humans. We can’t wait to see what else Wright has in store for us and we’re definitely going to be familiarizing ourselves with her other work in the meantime.